Are you at the point in your house plan search where you’re asking yourself: How many bedrooms do I really need? When approaching the home building process, your first step should be to define your goals and priorities according to your current stage in life and the upcoming future. Why do you want to build a house? What are some of the things you would like to do in and with your new place? What are the main priorities in terms of space, features, and amenities? Determining these necessities takes a little foreshadowing, in order to figure out what your family might need in the future. Look at the number of people currently in your family. If you have a family of four, with two children, you will probably require 4 bedrooms because each child may need his or her own room. Do you need a guest bedroom? Do you often host family members or friends at your home for various lengths of time? Make sure they are comfortable by having a dedicated area of the house exclusively for guests. 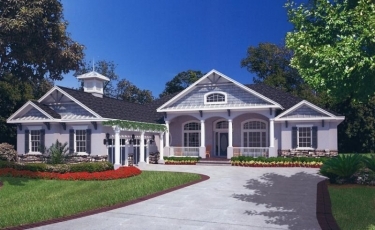 Explore our over 4,600 four bedrooms house plans. Will your family grow further? If there is any possibility for additional children, you may want to consider planning ahead and selecting a house plan with a greater number of bedrooms. Do you work from home and require a home office? Many house plans offer this as an additional feature — typically, a home office is located off of the main area of the home, such as a living room. However, you might want a quiet location in an out-of-the-way area of your home. Thus, an additional bedroom may function as a home office. Or is there a nook in the house that can function as an office and eliminate the need for an extra bedroom? 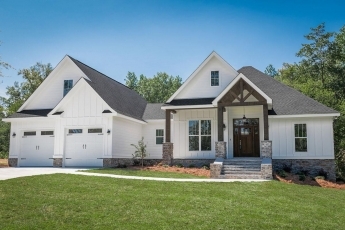 If three bedrooms are all you need, search all of our house plans that feature 3 bedrooms. Will you possibly take care of an aging parent and/or grandparent at some point? If there is even a possibility of an elderly relative coming to live with you, building a home with that extra bedroom space will be very helpful in the future and make that transition much less stressful. Do you have a hobby that requires its own space? Like exercising or crafting, some hobbies are space hogs and having an extra bedroom will make continuing that hobby easy in your new home. As you build your home, plan for the long term by selecting the correct number of bedrooms. Start your search on America’s Best House Plans by designating the desired number of bedrooms, and then going from there. All types of styles offer a wide range of bedrooms within that particular style. Make sure to keep your budget in mind when finalizing the number of bedrooms you want and remember to enjoy your search!